Two old adversaries in the final of WC.T20, which it self was a record of sorts. The match played at Kensington oval, Bridgetown, Barbados turned out to be a tame affair, the mighty Aussies succumbing at the tape. On a bouncy wicket, England won the toss and invited the Australians to have the first go. England with Sidebottom,Bresnen, Broad, Swann and Yardy were a better balanced outfit, than the Aussies, who packed their side with pacers Nannes, Tait, Johnson, Watson and Smith. Like the semifinals against Pakistan, Australians had a poor start at 8 for three wickets, in the third over. Watson, Warner and Haddin were gone for 2,2 & 1. Sidebottom was running through the Aussies at this stage. Clarke 27 of 35 added 37 runs in 43 balls with David Hussey, before he was consumed by Collingwood of Swann. The next 50 runs between David Hussey and Cameron White came in 36 balls, when White fell for 30 of 21, caught by Broad of the part timer Wright. Fifteen overs were gone at this stage for 95, when Mike Hussey joined his brother David. Unlike the semifinals, Mike could not fire away, and added 47 runs, before David was run out for 59 of 73 balls. Australians finished at 147 for 6, with Chris Broad bowling an economical 20th over. Sidebottom 2 for 26, Swann one for 17 and Wright one for five, shared the spoils. England lost Lumb for 2 runs in the second over. There after, it was England all the way. 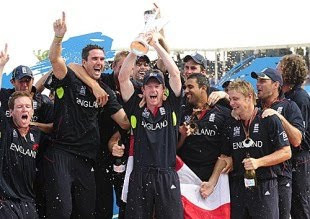 Man of the match Kieswetter 63 of 72 and man of the series, Kevin Pietersen 47 of 59, took England to safety, before Collingwood 12 of 15 and Morgan 15 of 11 , won the match for England by seven wickets. England finished at 148 for 3 in 17 overs. Tait, Johnson and Smith took a wicket each. England a team without any superstars, have won the cup due to shear determination, precise planning and disciplinary approach. They thoroughly deserve the victory.